Royal Caribbean’s Harmony of the Seas cruise ship has had a very special visitor – none other than pop sensation Gary Barlow! The cruise ship was home to Gary and screenwriter, Tim Firth, for a seven-day stay while they carried out research for a new musical. This comes just weeks after the launch of the ‘The Band’ musical, featuring the music of Take That, which launched in September this year. The two reported that this new musical will hit the stage in 2021, with Gary saying, ‘making music at sea is new’ for him. The crew showed the pair how the whole ship runs, offering VIP access to the gears and cogs which really make Royal Caribbean special. The itinerary departed on the 30th September, featuring visits to Florida, Hispaniola, Jamaica and Mexico – each of which are inspiring locations to stir musical creativity. 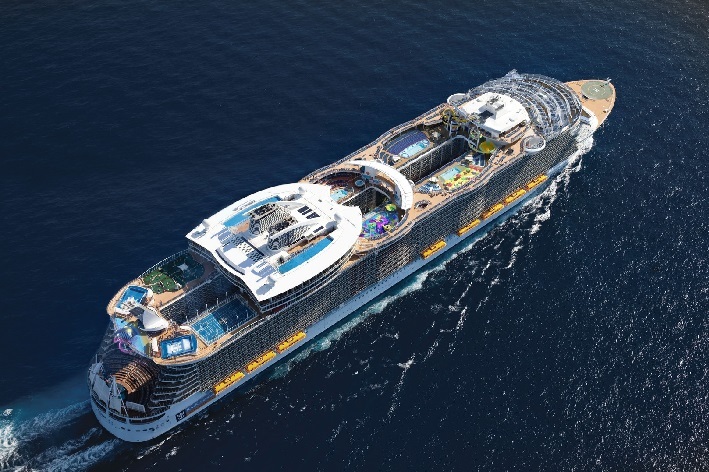 As 2016’s ‘Largest Cruise Ship in the World’, Harmony of the Seas is bold and beautiful. Boasting restaurants featuring Alice in Wonderland themes and Jamie Oliver’s first-class cooking know-how, the ship has wowed guests since its debut. Spellbinding activities include outdoor movie nights, the 40-foot surf simulator FlowRider and the tallest slide at sea – the Ultimate Abyss. It is no wonder Mr Barlow chose this ship for his time at sea! Royal Caribbean has been voted the best cruise line in the Caribbean 13 years running, making it one of the most prestigious fleets at sea. On-board, Harmony of the Seas caters to all – from robotic bartenders at the Bionic Bar to the hit Broadway musical, Grease, there is fun to be had at all times! With a choice of Interior, Ocean View, Balcony and Royal Suite rooms, the ship offers an alluring escape from the hustle and bustle on-deck. Deluxe facilities and luxury accommodation create a truly magical experience from start to finish. With a vast fan base and Take That following, this ship is sure to be popular with Gary Barlow fans in the next few months, seeking out the specialist service only Royal Caribbean can offer. If you are longing to sail the seas and experience the unique itineraries of Harmony of the Seas, take a look at our Royal Caribbean cruise deals for ships that are in a league of their own. Previous StoryHurricane Irma update: Which areas of the Caribbean are affected?